that’s a very threatening balloon!!! 3 weeks into his New York Residency and the city is reeling with excitement. We are being cajoled with his humor and subversive tricks into opening our eyes and minds. We can’t distinguish between what is what without context, as his “Spray Art” Sale in Central Park proved. No labels, no pitch, no sales*. We don’t take the time and we don’t have the confidence to trust our own judgments. We have to make sure there is an endorsement and that it comes from the right side before we make our own. Banksy encourages us to decide for ourselves and create our own context. “What do you think?” is not a trick question. His sortie on New York is a gift. Pay attention. 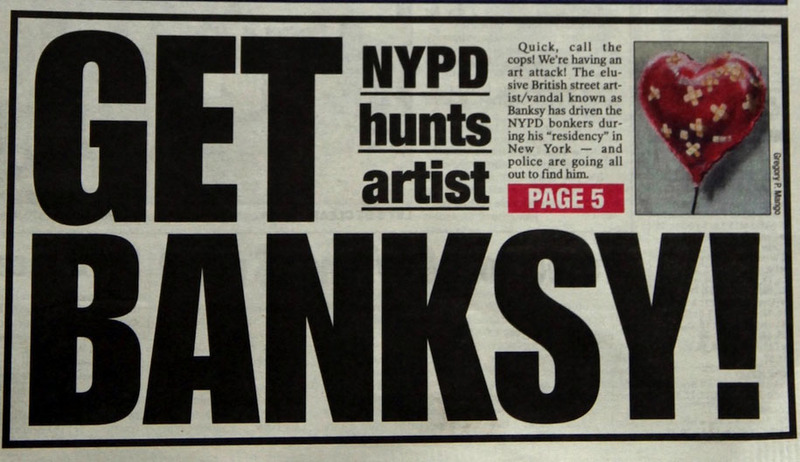 Wake up and smell the Banksy’s. *actually $420.00 for a street vendor is not so bad.